Religious and secular communities ritualize some books in one, two, or three dimensions. They ritualize the dimension of semantic interpretation through teaching, preaching, and scholarly commentary. This dimension receives almost all the attention of academic scholars. Communities also ritualize a text’s expressive dimension through public reading, recitation, and song, and also by reproducing its contents in art, theatre and film. This dimension is receiving increasing scholarly attention, especially in religious studies and anthropology. A third textual dimension, the iconic dimension, gets ritualized by manipulating the physical text, decorating it, and displaying it. This dimension has received almost no academic attention, yet features prominently in the most common news stories about books, whether about e-books, academic libraries, rare manuscript discoveries, or scripture desecrations. 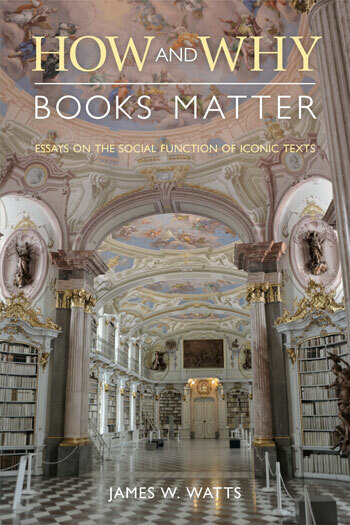 By calling attention to the iconic dimension of books, James Watts argues that we can better understand how physical books mediate social value and power within and between religious communities, nations, academic disciplines, and societies both ancient and modern. How and Why Books Matter will appeal to a wide range of readers interested in books, reading, literacy, scriptures, e-books, publishing, and the future of the book. It also addresses scholarship in religion, cultural studies, literacy studies, biblical studies, book history, anthropology, literary studies, and intellectual history.